1/2 lb flat iron steak or sirloin steak, thinly sliced against the grain. Cut zucchini in half lengthwise, scoop out the inside into the bowl and reserve it for later. Place zucchini boats into a baking tray, sprinkle with olive oil, season with salt and pepper and bake at 350F for 15 minutes. Heat a tablespoon of olive oil in the frying pan, add onion, bell pepper, reserved zucchini, season with garlic powder, salt and pepper and cook stirring for 5 minutes or until tender. Remove from the heat and set aside. Season sliced beef with coriander powder, salt and pepper. Add a tablespoon of olive oil to the same pan and increase the heat to high. Add sliced beef and oregano and fry for 2-3 minutes per side. 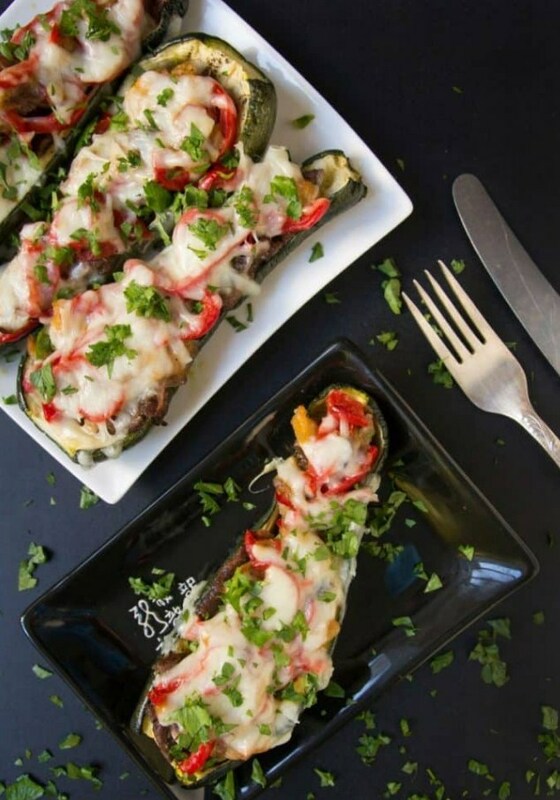 Load zucchini boats with cooked beef, cooked vegetables, sprinkle with mozzarella and return back to the oven for 8-10 minutes. Serve garnished with chopped cilantro (optional).